What have we been up to for the past few weeks? 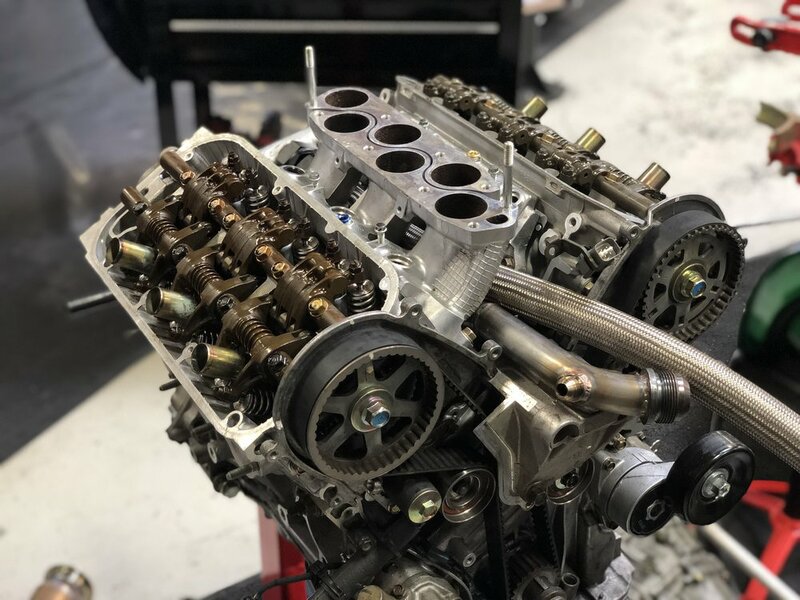 We removed the A2's heads (which feature larger intake valves compared to the A1) and delivered them to our local machine shop in order to clean them up and prepare them for all of the Supertech goodies. A week later, we got them back. Aren't they beautiful? 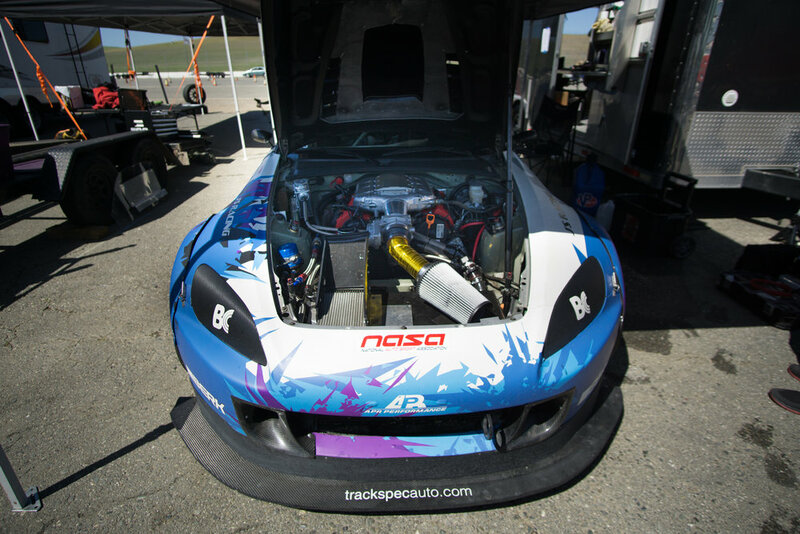 We assembled the components at Trackspec and while we were at it, we made a few improvements to the cooling system on the A2. Check out those huge dash 20 AN lines. After assembling the engine, we bolted the transmission back up to our Inline PRO adapter kit, put the ASP headers and P2R fuel-rails on, and re-attached it to our Hasport motor mounts on the subframe. We were ready to lift this back into "Irene". We topped the engine off with fresh Motul 300V 10w40 (our favorite engine oil for performance and longevity). Last month, we tested at Thunderhill and raced at Sonoma with an OEM Honda 4.1 differential because my upgraded unit was still being rebuilt by my partner Ben Herne, aka Puddy Mod. Ben took another differential that I had, and replaced all of the seals and hardware. He then refreshed the CT Engineering straps and refinished them in black phosphate. Ben uses his own proprietary PuddyMod solid steel sleeve on the pinion. Note: the WPC treated gears. Puddy Mod balanced the carrier and the ring gear. Setting the bearing preload with the solid steel sleeve. The finished rear end with a Mazdaspeed 3.63 final drive in order to better take advantage of the J32A2's power-band. As soon as we got the diff back from Ben in Florida, we put it into the car. As always, we use Motul 90PA fluid in the differential because it works really well for LSDs; both in terms of performance and also reliability. The final piece of the puzzle before we re-aligned and re-corner balanced the car was to cut the hood. We discovered the A2's intake manifold is significantly taller than the A1. As such, my hood wouldn't close. Oh, well. Function over form any day. We ended Round 1 last month with only 69 points (the ST4 points leader currently has 200) after the A1 engine let go during the Saturday race. And while the season is just getting started, it's important for us to secure as many points as possible at each and every race weekend if we want to defend our championship title from 2017. Going into Round 2, I was determined that we do well. After a solid 8am practice session on Saturday, I ended up P3 in qualifying at 11:25am which is where I would start the race. Jon giving the car a once-over before the 3pm race. There were quite a few position changes during the race, and in the end I finished 3rd on the Podium. Pretty good, considering this was only my third time ever driving the car with the V6. I was also on tires that we had used at last year's championships race in October because I've been wanting to learn how to drive my car with less than optimal rubber in preparation for the 25 Hour. Sunday's schedule was incredibly tight. We had practice at 8am, qualifying at 10:25am and the race was at 11:45am. This meant we had exactly one hour between qualifying and the race. I felt GREAT after morning practice. I ran a new ST4 personal best time of 1:58.4 and was feeling really happy about how the car felt. We had just switched to another set of tires in the morning. These were ones that I raced on at Sonoma for the last event of the Northern California Regional Championship in late October of last year. They felt noticeably better than the tires from the day before. Sunday was much warmer, and as such we decided to top off the cool suit box. Unfortunately, I made a mistake during qualifying and it was a costly one. I was super committed to a flying lap and I came up really fast on a Legend Car into T8. I thought I would have enough room to squeeze around him, but he checked up super hard and in order to avoid fully rear-ending him I drove off the track. Doing so meant I broke off 1/3 of my front splitter, which subsequently flew up and cracked my windshield. Doh! We were all hands on deck after qualifying because we had such a short amount of time before the race. Jon and Marc hustled to prep "Irene" and clean up the damage while I took care of filling the car up with gas. Victoria did an amazing job of capturing all of the excitement, as evident by the wonderful photos in this blog episode. To say that the race was exciting is a bit of an understatement. I had once again qualified in P3, despite that session ending early when I went off track. This meant I started the race behind the EDGE E36 M3 (who got pole) on the 2nd row of the grid. I highly recommend watching my in-car video in order to fully experience what happened. After 30 minutes of action and drama I would finish in 4th place, nose to tail with the same car that I started the race behind. What a day! We packed up quickly, eager to head home and begin repairs and additional improvements to "Irene" before Round 3 at Sonoma in May. Check back soon for more updates! Newer PostPodium Finish and a new PB!